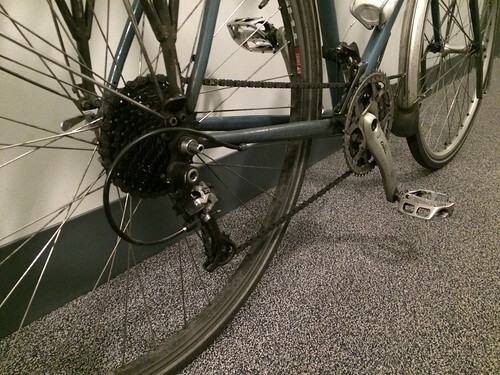 As I wheeled my bike along 58th Street in midtown Manhattan in a heavy rain shower last Wednesday, I noticed a periodic scraping sound from the vicinity of my rear brakes. Realising that one of the brake pads was rubbing a slight bump in the wheel, I delved into one of my pannier bags, pulled out a multi-tool and set to work. I marginally tightened the left-hand brake calliper and loosened the right-hand one about the same. I was pleasantly surprised to hear the sound had stopped and that, when I started riding down Lexington Avenue, the brakes were working as well as they ever do in the slitheriness of a spring downpour. mediates many of my interactions with the world. The incident made me realise how, even though I still regularly make comically silly mistakes when trying to maintain my bike, I’ve come to know its ways. My attempts to fix faults are growing steadily less disastrous. It also made me think, harder than I have for a while, about quite how intense and symbiotic the relationship between a regular cyclist and his or her main bike can be. 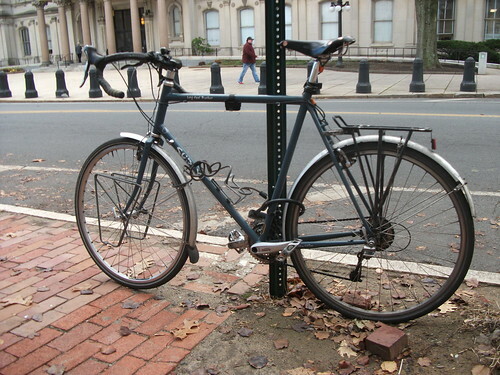 My body has gradually shaped this bike – on which I’ve ridden about 30,000 miles over seven years – to fit its needs. I’ve steadily fitted tougher and tougher rear hubs after cheaper ones collapsed under the strain of hauling my tall, heavy body away from traffic lights. The bike, meanwhile, has shaped my body. My bulging leg muscles testify to hundreds of twice-daily climbs over the Brooklyn and Manhattan Bridges. If something on the bike changes - the brakes, say, are tightened - I find myself so used to how they used to be that it takes me some time to adjust my reactions. only after breaking every other brand available. It’s because of this intense symbiosis, I think, that for many cyclists their main bike excites far greater passion than its status as a possession should suggest. A bike becomes one’s own more and more over time, much as a pair of shoes does. My Surly Long Haul Trucker probably shapes how I interact with the world more than any possession except my spectacles. It’s hardly surprising that, even more than dogs, bikes seem to start taking on an appearance similar to their owners’. My midtown incident also, however, threw my mind back to the Thursday before Easter, when I encountered a High School student struggling with his bike on the Hudson River Greenway. He asked me to lend him a pump to inflate his obviously punctured rear tyre. Recognising that mere extra pumping wouldn’t get the young man all the way home to Williamsburg, I fixed the puncture for him. But I also felt grateful for the years of advice and training from my father, bike shop staff and fellow cyclists that ensure I’m never similarly forced to rely on the kindness of cycling strangers. The downside, after all, of the elegant simplicity of a bicycle’s workings is that simple often isn’t self-explanatory. In an era when carmakers are warning customers that they shouldn’t on any account try to repair their vehicles because of the sophistication of their software and electronics, most bikes remain resolutely mechanical. They are still controlled by systems of levers and springs, actions balanced against equal and opposite reactions. My bike's rear mechanism: action and reaction exemplified. 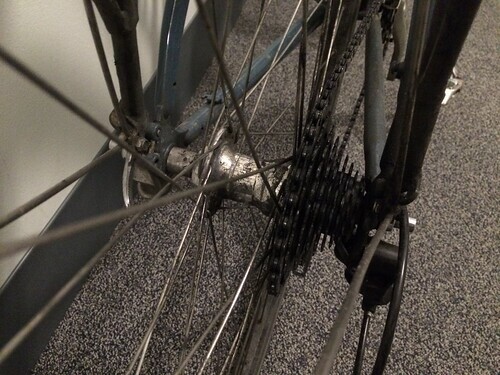 It requires some understanding of derailleur gears to grasp, however, that the cable for the rear sprockets needs to be tighter if the bike isn’t shifting easily onto the easiest gears. When I undertook my roadside repair last Wednesday, I was tensioning the spring in the left calliper and loosening the spring in the right one. I was using my knowledge and experience of how the two sides of the brakes push against each other. It’s not only worth understanding these systems for purely practical reasons. There’s a poetry to the way a rear mechanism pushes a chain between the sprockets of a derailleur gear that is a powerful testimony to human ingenuity. 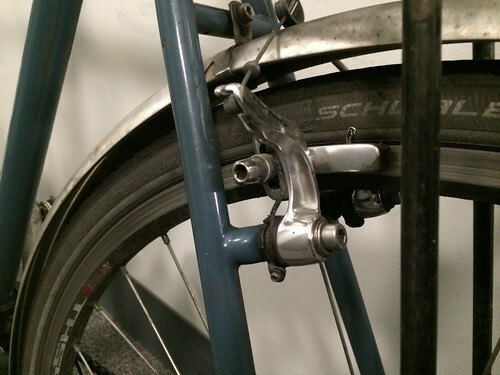 It’s compelling evidence of how humans learn from their predecessors and make progress that I can now so easily adjust my brakes thanks to simple adjustment mechanisms. That was impossible with the bikes I owned 20 years ago. The sheer range of different ways of making a bike work also testifies to the dazzling range of different things people seek to do with bikes. I ride a bike with plenty of gears and a solid frame because it fits with the relationship I want between my body and the bike. When I had bikes with harder-to-change gears, I used to get sore knees from pushing on the pedals in a less-than-efficient gear. I shift gears hundreds of times every journey now and my knees suffer no longer. The frame of one old, alloy bike broke under me. My steel frame has withstood the stresses of one crash with a car, another with another bike, huge loads of weekly shopping and transporting, at different times, both my children. I marvel at how smoothly the steel frame copes with corners, removing the sense that I’m wrestling with the bike to get it to turn. 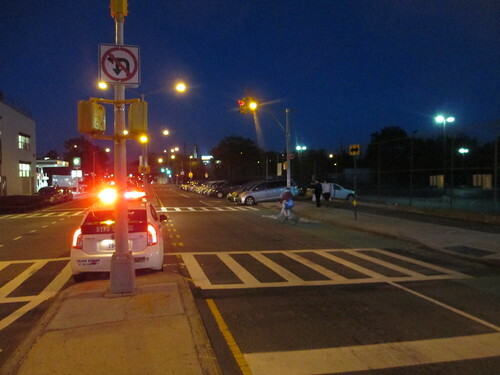 The range of different balances between body and bike came home to me on Saturday night when the Invisible Visible family and I headed the short distance from our apartment to the Red Hook Criterium, a cycling road race near our apartment. 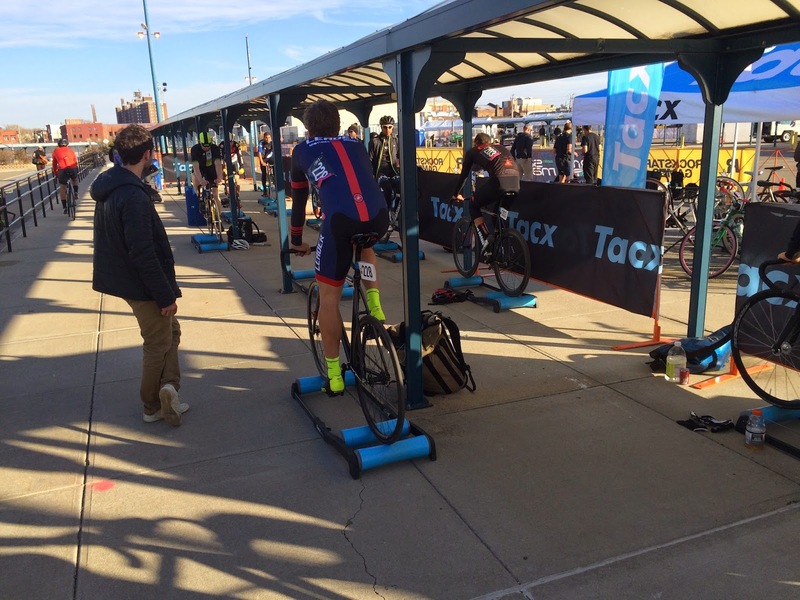 The race compels riders to use track bikes – light, brakeless and with fixed wheels – rather than more conventional, multi-geared road bikes. The trade-off was plain. The event teemed with cyclists with leaner, stronger, more efficient bodies than mine, honed to handle the rigours of a far less forgiving bike. We watched awestruck as these hyper-fit riders and their stripped-down machines negotiated the 1.25km circuit, ticking off some laps in less than 90 seconds and swishing by us at well over 60kph. I’ll never zip round a track like these fit young men. Nor will I ever dance up Alpe d’Huez like Chris Froome, except in my imagination. But there is a similar satisfaction in the relationship between our bodies and the machines. For the Criterium riders, Tour de France participants and me, the bicycle magnifies our bodies’ efforts. For the Criterium riders, it was a question of a carbon frame's coping with the strain both of rapid acceleration and of being slowed down for a corner only through the rider’s resistance against the pedals’ spinning. My bike has to absorb the shock of a hidden pothole then let me skip swiftly away from the next traffic lights while the drivers are still looking at their smartphones. from my cycling but, yes, their bikes offer similar joys. Even for me, being on a bike can resemble being in possession of a superpower. On an empty, flat road, it can feel when I slip the chain onto the biggest, fastest chainring as if I’m Mr Scott pushing the button to send the Starship Enterprise into warp drive. A range of new, higher speeds is suddenly at my command and my speed surges. As I labour up steep hills, meanwhile, I reach the lower limits of the lowest gears on my middle chainring. Then I feel a little surge of joy as I switch down to my smallest chainring, pedalling grows easier and nearly any slope is within my reach. It’s not often that I’m seized with the desire to deface a sign in a public space. But, on a walk with the Invisible Visible Woman on Easter Sunday, I came very close to hacking down the handwritten notice that a householder in Nelson Street, near our apartment, had attached to a pole on the sidewalk. “Please do not lock bicycle here, Thank You,” read the laminated note. The sign infuriated me because it struck me as an arrogant attempt to appropriate the right to dictate what happened on the public street outside the householder’s home. As a New York City taxpayer who in theory is on the hook for the cost of keeping the pole in place, I experienced the appropriation as a kind of theft. Yet the more I’ve thought about it since, the more I’ve recognised that the householder’s act stood out only in the explicitness of its expropriation of public space. Nelson St, where parking is free, as it is on the vast bulk of New York City streets, was lined on both sides with parked cars. They had together turned the street from a potentially healthy artery in the city’s road system into a clogged, ill-functioning one. With fewer idle vehicles, the street could have had wider sidewalks, extra space for moving cars or, of course, a proper bike path. But the sign on Nelson St – which I suspect was put there to ensure the householder could park his or her car without worrying about a bike’s obstructing the doors – illustrates how many people fail to grasp the true nature of free, on-street parking. There’s a tone of outrage about any effort to remove or curtail access to on-street parking that suggests many people think of parking spaces as essentially their property. The sudden gaps in New York’s cycle routes – where protected lanes turn into painted ones or painted lanes degenerate into “sharrow” markings – illustrate how tenaciously some communities hold onto their precious storage spaces. a stark illustration of the depth of the city's problem. It's my strong suspicion that the defence of parking arouses such fierce passions partly because the privilege is defensible only in emotional, rather than logical, terms. Motor cars in most developed countries, after all, spend on average 95 per cent of their time parked, taking up vast quantities of space given the paltry 5 per cent of their lives they spend actually moving. I suspect the idle time for many vehicles in New York City – where even carowners frequently commute by subway – is still higher than the average. When they are moving, in addition, cars rely on a supply of free parking spaces at their destination. That must mean most cities have parking spaces to store far more cars than actually exist in the city. By definition, that’s space that’s taken away from actually moving things and people or generating economic value. The route to rational use of space and transport policy in many cities will almost literally have to run through the abolition of free on-street parking. All that aside, I nevertheless feel some sympathy for motorists living in big cities over the stress of parking. There’s a purgatorial edge to the experience of trying to end one’s journey yet finding oneself desperately circling, running later and later for that meeting, and unable to stop. It’s certainly no coincidence, I suspect, that a recently highly-publicised incident in New York where a police detective unleashed a tirade of racist vitriol at an Uber driver started when the detective was under the strain of looking for a parking spot. I remember one resident's telling me in Fort Greene, when I was working on a story about the introduction of Citibike to the area, how he resented the loss of two parking spaces for a bikeshare station on his street. He already frequently spent half an hour circling looking for a parking spot at the end of a journey. 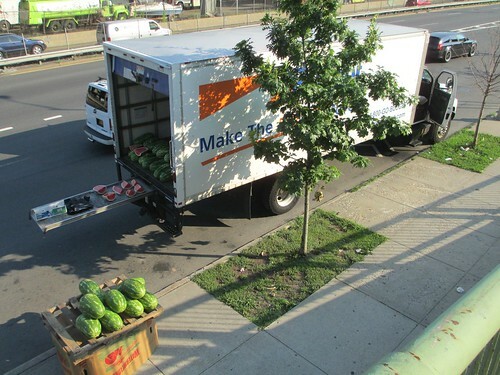 out in the middle of a busy street in The Bronx? 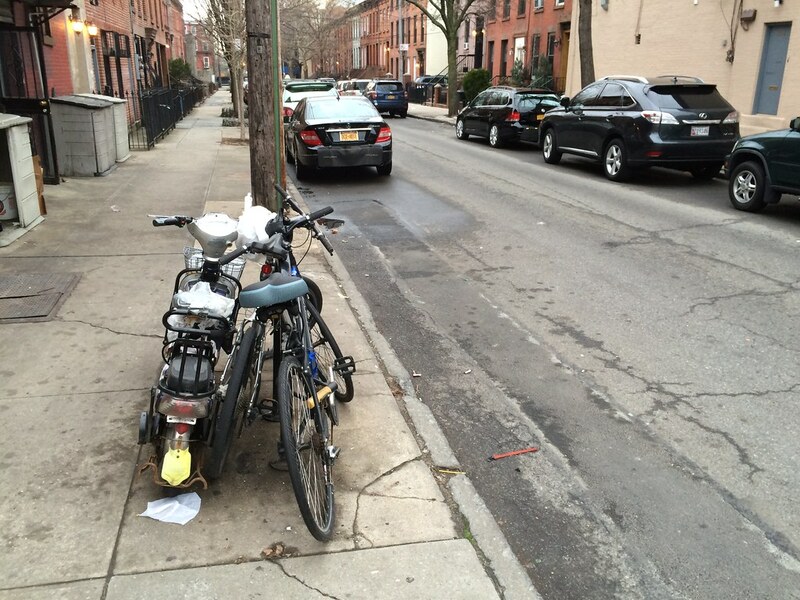 New York City also imposes on drivers the deeply-resented ritual of alternate side parking. Vehicles are banned for certain, brief hours each week from being parked on a certain side of each street, so that street cleaning machines can clean right to the kerb. When I first arrived in the city, I was baffled occasionally to see cars lined up, double-parked, on the wrong side of the street, their drivers patiently waiting for the sweeper to pass. But it’s also easy for those used only to New York’s odd ways of doing things to lose sight of quite how anarchic the city’s parking culture is. When I lived in London, because most local shops had designated loading and unloading zones, it was rare to have to dodge round double-parked unloading trucks. In New York, double-parking is so endemic that Joel Rivera, a city council member, in 2013 introduced legislation, thankfully unsuccessfully, to make it legal for parents picking up children from school to double-park briefly. Right by an intersection? Check. In the bike lane? Check. parking chaos by terrible example. When I visited Fort Greene to write about Citibike, local residents complained that residents of farther-flung parts of the borough drove to Fort Greene, parked on its streets and took the subway into Manhattan. Where I lived in London, the rules restricting some parking to holders of residents’ parking permits or their guests made it far harder for commuters to clog up local streets. On my morning bike ride to work, even turning traffic lanes are clogged with parked vehicles which, because they are displaying the badge of some law enforcement agency, will be left unmolested, no matter how dangerously they are parked. I had never encountered such blatant abuse of official position - sadly a fairly standard aspect of NYPD behaviour - when living in the UK. Five vehicles double-parked nose-to-tail in a rush-hour bike lane. In other news, New York's cycling rate seems to be stalling. 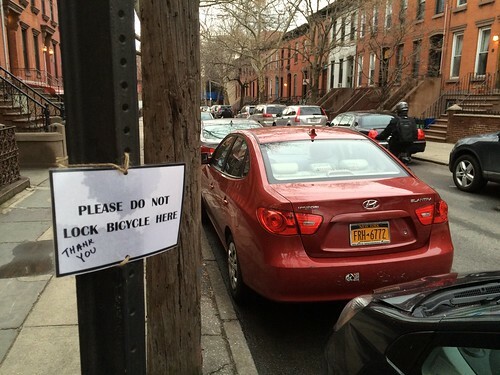 The effects of New York’s parking anarchy and the reluctance to tackle it are far-reaching. It’s thanks to parking’s being sacrosanct that I’m so often forced to ride up streets with narrow bike lanes painted in parked cars’ door zones – the most dangerous place to ride on the road. The lanes would be far better if more parking spaces were removed. Free on-street parking condemns vast swathes of land to producing no economic value at all. In many cities, congestion is one of the biggest external costs of motor vehicle use – and the presence of parked and double-parked cars on streets can only add to the hold-ups. 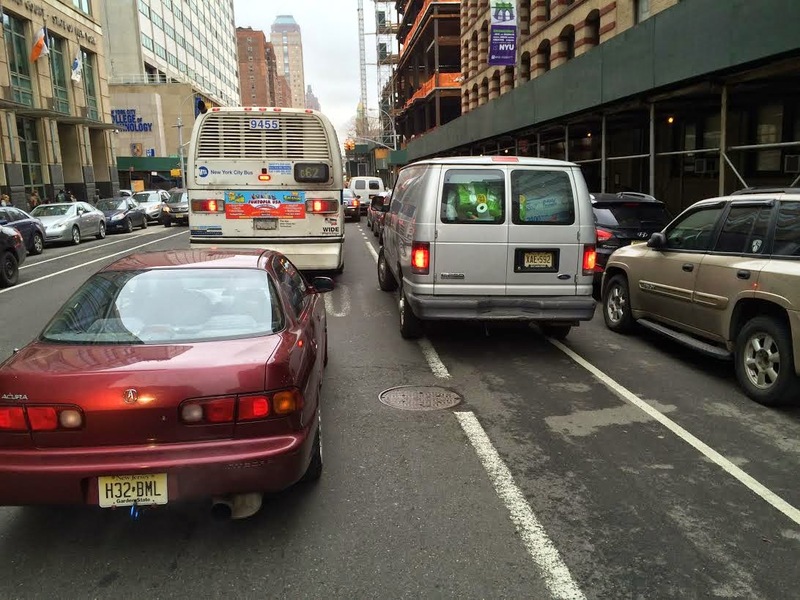 It significantly exacerbates the shortcomings of New York’s often inadequate bike lane network that vehicles park in many parts of it – both those segregated from traffic and painted lanes – with impunity. Cars parked right up to intersections frequently obscure what’s going on at intersections, increasing the risk of collisions. The sheer unpredictability of grappling with the constantly-shifting landscape of illegally-parked vehicles adds significantly to the stress of cycling in New York – and surely helps to account for the miserable proportion of trips in the city made by bicycle. they're ruining the place, you'll fit right in. There are few mysteries around how to alleviate cities’ parking problems. I remember my parents scrambling 40 years ago to buy parking tickets on my grandparents’ street in Edinburgh in Scotland under a then-new scheme to bring order to the city’s parking. It’s impossible to imagine so many New Yorkers would hang on to barely-used cars with dubiously-legal out-of-state registrations if parking cost a realistic amount in the densest parts of the city. Yet I’ve heard since spotting the sign on Nelson St a week ago of a similar sign on another post elsewhere in the city. I see no evidence of any politician’s being willing to tackle the misery created by the wholesale storage of idle cars. New Yorkers continue, it seems, to accept the many problems created by motor vehicles but to express rage at the presence of far more space-efficient bicycles. Until that fundamental dynamic changes, many streets look set to continue to be like Nelson St – choked by the status quo, but full of residents raging at the prospect of change.